Make sure you pack swimwear with no zippers or metal parts, a towel and some sunscreen. 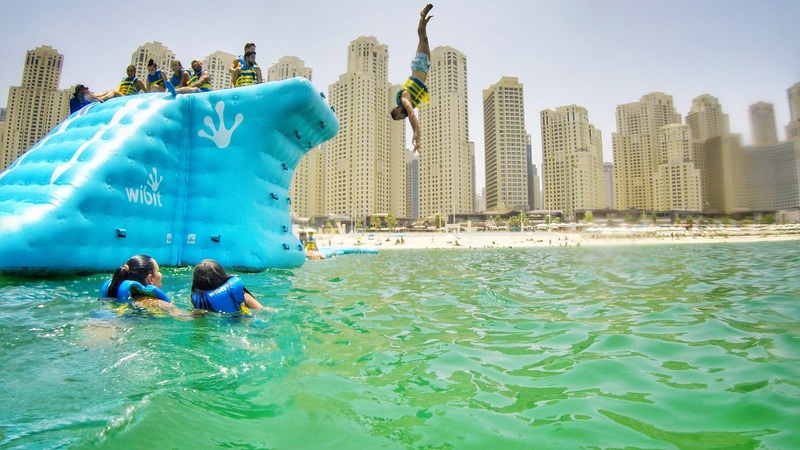 Visit the world's largest inflatable aqua park located in JBR beach. Come and have fun under the sun at Aqua Fun. With the best backdrop in the city, you're sure to have fun no matter your age or size. This is the perfect outing for the whole family to enjoy, with 101 different kinds of obstacles there’s something for everyone. You can even burn as many as 800 calories if you manage to finish the whole course from start to end! Have a go at the world’s longest and highest inflatable water slide, or see how fast you can complete the entire course! Life jackets are available for everyone from 5-year-old kids all the way to XXXL. Even if you aren’t a confident swimmer there are 7 life guards on board at all times to make sure everyone is safe. To make the most of the experience you may also want to bring non-slip shoes and goggles, and a GoPro camera or any similar action camera. Aqua Fun even has waterproof cases that you can buy or rent for your camera.